Child abuse is a problem of particular concern to physicians and other professionals caring for children. Symptoms of physical abuse in children, especially infants, are often nonspecific and may overlap with numerous other clinical conditions. Therefore, radiologists play a key role in identifying imaging findings to make the diagnosis of physical child abuse.1 While clinical clues to the diagnosis such as bruises and burns may exist, in many cases, there is absence of external signs of trauma, and imaging findings will be the first to raise suspicion of abusive injuries. Although many injury patterns may be seen with both accidental and nonaccidental trauma, there are some characteristic findings and injury patterns of abuse that should be recognized by radiologists who interpret pediatric imaging studies. 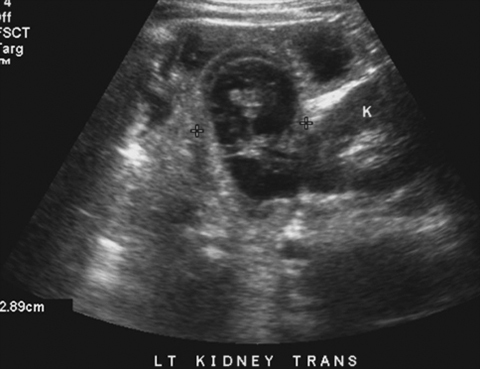 This review covers the characteristic imaging manifestations of child abuse, as well as diagnostic pearls, pitfalls, and limitations associated with skeletal, intracranial, spinal, and abdominal injuries. 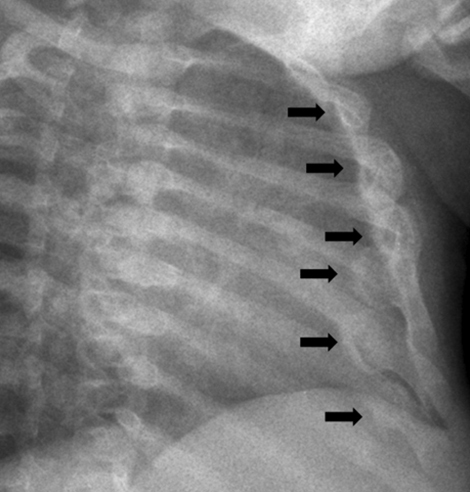 Rib fractures in infants younger than 1 year are highly specific for abuse. The proposed mechanism is tight encirclement of the rib cage by the person who shakes an infant, which leads to antero-posterior compression of the rib cage. The fractures typically occur in the posterior and lateral aspects of the ribs and less commonly anteriorly (Figure 1). CMLs in infants are highly specific findings of abuse. The proposed mechanism is shearing with torsion and torque of the extremities that lead to metaphyseal fractures. 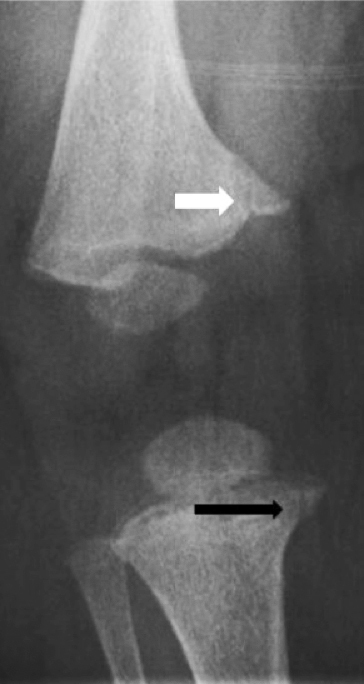 The fracture line is nearly parallel to the physis and may appear as a corner fracture or a bucket handle fracture, depending on the part of the metaphysis involved and the radiographic projection (Figure 2). 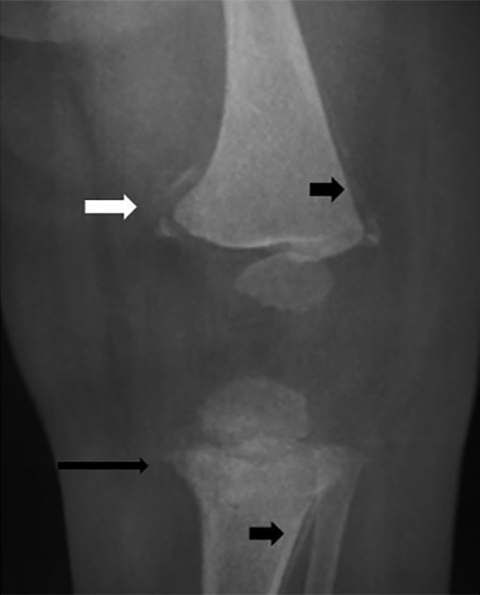 These fractures are most commonly seen at the knee (Figure 3), followed by the ankle and shoulder (proximal humerus). Although the above described fracture patterns have a high specificity for abusive trauma, correlation must be made with the clinical history, as other processes may result in similar injury patterns on imaging. All of the described fractures may occur with accidental trauma when an appropriate mechanism is present. 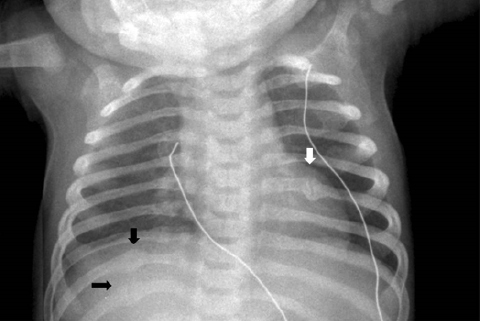 Rib fractures and CMLs have been described with traumatic deliveries, metabolic disorders (eg, rickets, osteogenesis imperfecta), and skeletal dysplasias.2,4 Rib and sternal fractures may occur with cardiopulmonary resuscitation (CPR). 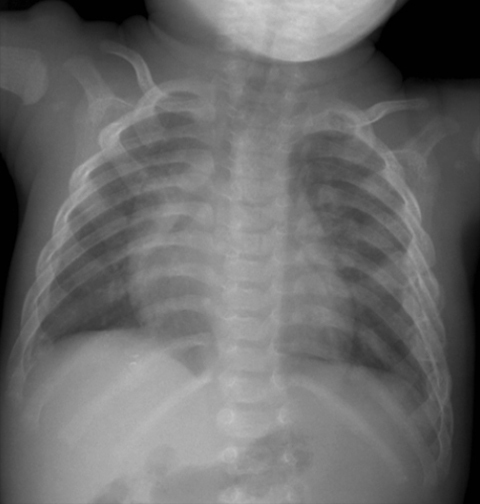 An important entity to keep in mind when considering the differential diagnosis of abuse is the metabolic bone disease of prematurity that results from nutritional deficiencies and may present with multiple fractures, including both metaphyseal and rib fractures in nonabused infants.2,4 In these cases, it would be helpful to review prior radiographs, from the time the infant was admitted, for any fractures and to review the medical records for possible clinical manifestations of fractures during admission (eg, extremity swelling or tenderness, transient elevation of alkaline phosphatase level, etc.). In premature infants, gastrointestinal processes, such as necrotizing enterocolitis, may lead to prolonged periods of no oral feeding and reliance on parenteral nutrition, which can result in nutritional deficiencies and subsequent fractures. 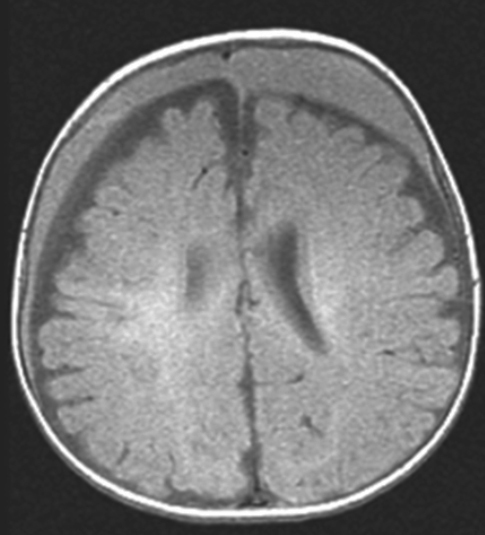 Another problematic entity is the “benign prominence of subarachnoid spaces.” This is a common condition of expansion of the subarachnoid spaces in infancy, typically presenting with an enlarged head. It is thought to be the result of imbalance between production and absorption of cerebrospinal fluid and usually resolves within 1-2 years with no neurological consequences. 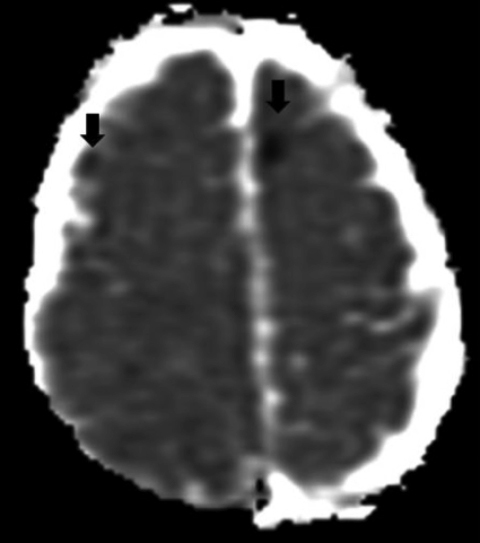 Nevertheless, there are several reports of cases of SDH occurring spontaneously in patients with this entity (Figure 7).10,11 This could be explained by increased motion of the brain within the skull due to the prominence of the extra-axial spaces, which may lead to stretching and rupture of bridging veins with otherwise trivial movements or trauma. 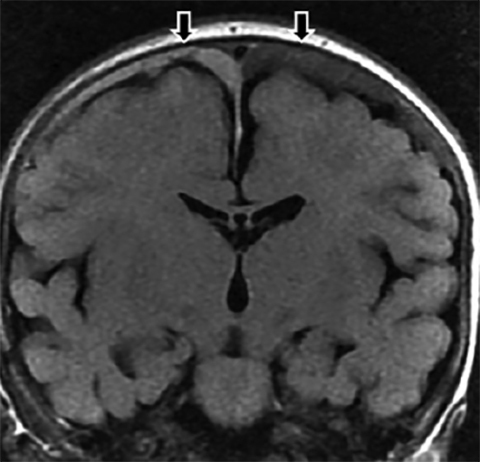 In such patients, cross-sectional imaging studies may show the prominent subarachnoid spaces in association with the SDH. It may be helpful to evaluate the infant’s head circumference and inquire about a family history of macrocephaly, as there is familial predisposition of this entity. Skull fractures may be seen in both accidental and nonaccidental trauma. 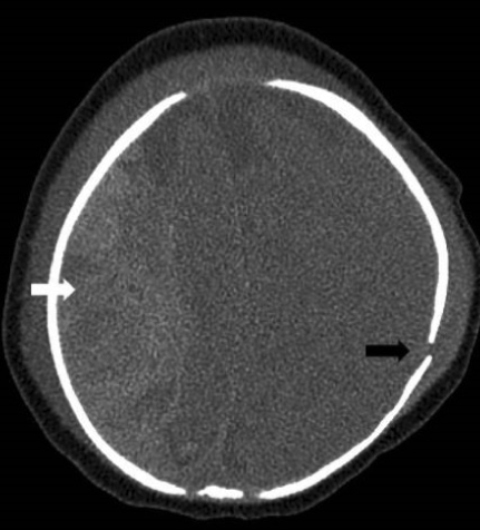 The probability of abuse in infants with skull fractures is estimated at approximately 30%.6 Some patterns of fractures have a higher association with abuse compared to accidental trauma, to include depressed, diastatic, and compressed fractures.5 Skull fractures may be diagnosed on radiographs or computed tomography (CT) scans. When diagnosing fractures on CT, it is important to obtain reconstructions, since fractures may be missed if they are oriented in the same plane as the axial slices. 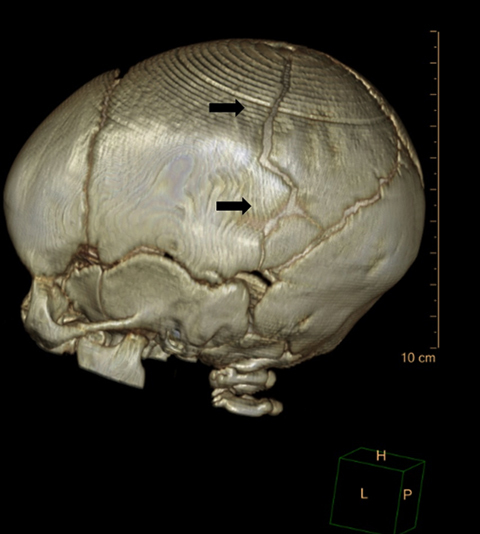 Three-dimensional (3-D) reconstructions are helpful in differentiating fractures from sutures, including accessory sutures and variants that are commonly present in children (Figure 8).12 Epidural hematomas are commonly seen in association with skull fractures. Dating of SDH on MRI is even more complicated, as there is significant overlap of the signal intensities between different stages of hematomas, and the evolution of SDH is less predictable than intraparenchymal hematomas. The potential influx of cerebrospinal fluid (CSF) into the subdural space can also complicate the imaging findings of SDH on MRI. Dating of parenchymal injuries is more accurate, particularly when there are ischemic changes with areas of cytotoxic edema that will present with restricted diffusion, which peaks within the first few days but may persist for up to 7-14 days. Evaluation with both CT and MRI is complementary and may improve the accuracy of dating injuries. Injuries to the abdominal viscera have been reported in abused children. They usually occur in toddlers, in contrast to the findings of abusive head trauma and characteristic fractures that are typically seen in infants. Based on a recently published meta-analysis,15 injuries to the solid organs and hollow viscera of the abdomen have been reported in abused children with similar frequencies. Injuries to the hollow viscera are more common with abuse than in accidental trauma with the duodenum most often involved. 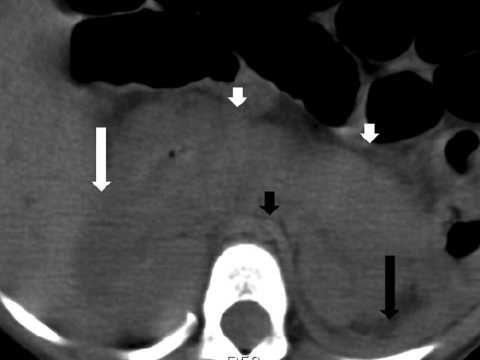 The duodenum may sustain a transmural hematoma, perforation or transection; the third and fourth portions of the duodenum are most often involved (Figure 9). The pancreas may also be injured in abusive abdominal trauma (Figure 10), as reported in association with duodenal injuries. 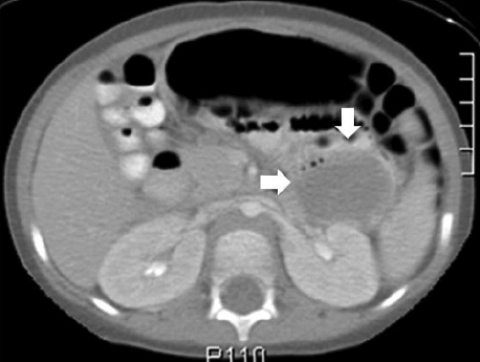 Pancreatitis is the typical early presentation, while psueodcyst formation is a delayed manifestation.15 Radiologists need a high index of suspicion of abuse in these clinical settings, since these entities are otherwise uncommon in young children. The possibility of abuse should especially be raised in young children with these findings and no clear history of significant abdominal trauma. Injuries to other solid abdominal organs, including the liver, spleen, and kidneys have been reported in cases of abuse. However, these are also very common in the setting of significant accidental trauma (eg, motor vehicle accidents). The clinical implications of visceral injuries are significant and should not be overlooked. It is estimated that they contribute to up to about 50% of child-abuse-related fatalities.15 As in many cases of abuse, the symptoms are often nonspecific, and a history of trauma is often not elicited initially. Children may present with vomiting; abdominal pain and bruises are not always present. Therefore, a high index of suspicion is required on both the part of the clinician and the radiologist. Imaging plays an important role in the diagnosis and investigation of child abuse. Due to the nonspecific clinical presentation of physical abuse, radiologists may be the first to raise suspicion of abuse based upon characteristic imaging findings. Characteristic findings include patterns of skeletal injuries (eg, rib fractures and CMLs), abusive head trauma, and blunt abdominal injuries (eg, duodenal and pancreatic injuries). Since these injuries may be fatal, or abuse may continue if not promptly recognized, it is imperative that these findings not be overlooked or underestimated. It is also important for radiologists to acknowledge that dating of abusive trauma is often limited and inaccurate. The primary role of the radiologist is to identify the patterns of abusive injury and identify findings suggesting various ages of injury, which is specific for abuse. The author thanks Isaak Manaster, B.S., for help with image editing. Adamsbaum C, Méjean N, Merzoug V, Rey-Salmon C. How to explore and report children with suspected non-accidental trauma. Pediatr Radiol 2010;40:932-938. Offiah A, van Rijn RR, Perez-Rossello JM, Kleinman PK. 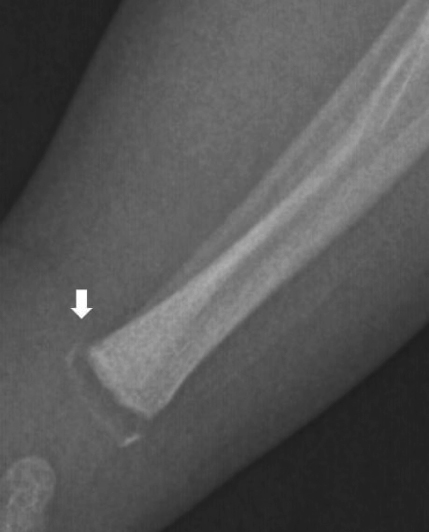 Skeletal imaging of child abuse (non-accidental injury). Pediatr Radiol 2009;39:461-470. ACR–SPR Practice parameter for skeletal surveys in children, Amended 2014 (Resolution 39). http://www.acr.org/~/media/ACR/Documents/PGTS/guidelines/Skeletal_Surveys.pdf. Accessed April 2, 2015. Kleinman PK. 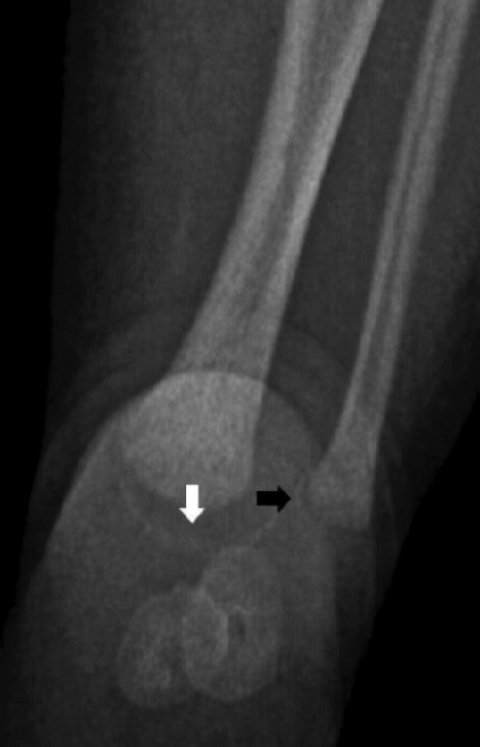 Problems in the diagnosis of metaphyseal fractures. Pediatr Radiol 2008;38(suppl 3):S388-394. Barber I, Kleinman PK. 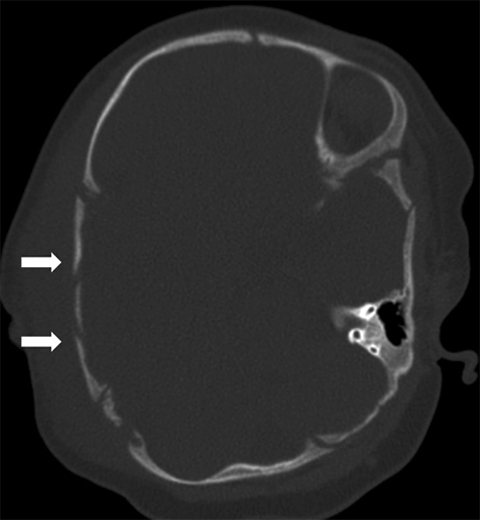 Imaging of skeletal injuries associated with abusive head trauma. Pediatr Radiol 2014 Dec;44(suppl 4):S613-620. Vázquez E, Delgado I, Sánchez-Montañez A, et al. Imaging abusive head trauma: why use both computed tomography and magnetic resonance imaging? Pediatr Radiol 2014;44(suppl 4):S589-603. Ichord RN, Naim M, Pollock AN. 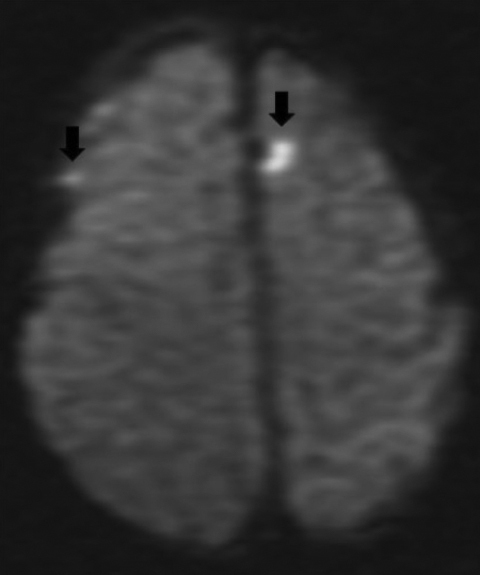 Hypoxic-ischemic injury complicates inflicted and accidental traumatic brain injury in young children: the role of diffusion-weighted imaging. 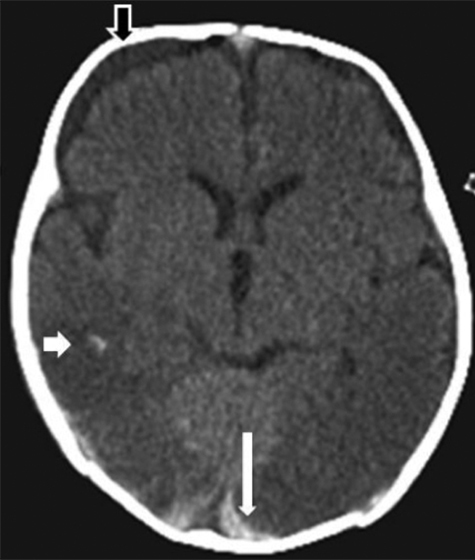 J Neurotrauma 2007;24:106-118. Nadarasa J, Deck C, Meyer F, et al. Update on injury mechanisms in abusive head trauma—shaken baby syndrome. Pediatr Radiol 2014;44(suppl 4):S565-570. Leventhal JM, Asnes AG, Pavlovic L, Moles RL. Diagnosing abusive head trauma: the challenges faced by clinicians. Pediatr Radiol 2014;44(suppl 4):S537-542. Jenny C. Alternate theories of causation in abusive head trauma: what the science tells us. Pediatr Radiol 2014;44(suppl 4):S543-547. Ghosh PS, Ghosh D. Subdural hematoma in infants without accidental or nonaccidental injury: benign external hydrocephalus, a risk factor. Clin Pediatr 2011;50:897-903. Medina LS. 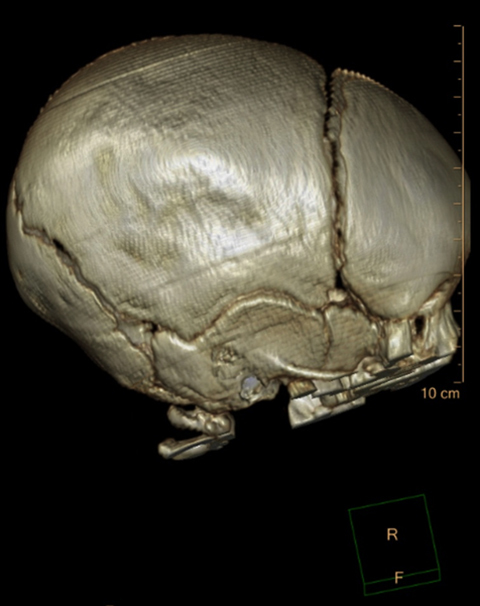 Three-dimensional CT maximum intensity projections of the calvaria: a new approach for diagnosis of craniosynostosis and fractures. Am J Neuroradiol 2000;21:1951-1954. Adamsbaum C, Morel B, Ducot B, et al. Dating the abusive head trauma episode and perpetrator statements: key points for imaging. Pediatr Radiol 2014;44(suppl 4):S578-588. Kemp A, Cowley L, Maguire S. Spinal injuries in abusive head trauma: patterns and recommendations. Pediatr Radiol 2014;44(suppl 4):S604-612. Maguire SA, Upadhyaya M, Evans A, et al. A systematic review of abusive visceral injuries in childhood—their range and recognition. Child Abuse Negl 2013;37:430-445. Blumfield E . Imaging in Child Abuse. J Am Osteopath Coll Radiol. 2015;4(4):5-11. Dr. Blumfield is with the Department of Radiology, Jacobi Medical Center, Albert Einstein College of Medicine, Bronx, NY.